More 2 stars chefs here. Other American chefs here. Other Nordic chefs here. More female chefs. 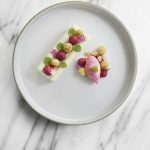 It was while working at Edsbacka Krog–the only Michelin two-star restaurant in Sweden at that time–where she discovered her love specifically for pastry, and worked there for four years. She then took a position at Restaurant Prinsen, one of Stockholm’s oldest and busiest bistros. 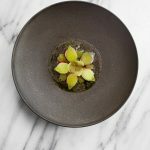 From there Bengtsson joined Operakällaren, the award-winning historical restaurant located in Stockholm’s Opera House, where she remained for nearly five years. 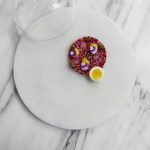 Håkan Swahn, the owner of Aquavit, saw talent and fresh perspective in Chef Bengtsson’s skillset and offered her the role of Executive Chef in spring 2014. 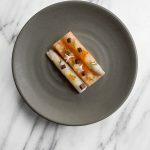 She accepted the job, and since then has injected the critically acclaimed menu with her personal style and experience. 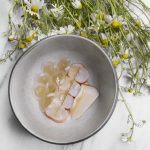 In October, her work garnered a second Michelin Star for Aquavit, making her the second female chef in the U.S. to run a two-star kitchen and the first ever Swedish female chef to do so. 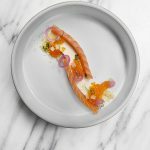 In fall 2018, Bengtsson was named “Best Female Chef” by the Best Chef Awards. Bengtsson is also an avid dancer of bachata, a form of Latin American dance originating in the Dominican Republic, and participates in international summits and competitions. More 2 star chefs here. Other American chefs here. Other Nordic chefs here. Go back home.